How could I not do so with such a CUTE face? Loke’s recovered some what, but still not completely. So, I haven’t been cycling much because my interest in the trike drains away when I can’t take the fuzzy one with me. Today, with a bit of pressure from Jens, I decided to take Loke for a rolling walk. His breathing still seemed a little off, but it’s hard to tell because for all I know I’m just becoming accustomed to the oddness. I did let him go a tiny bit faster than 4.5 – 5 mph. He also ran a bit, but not as much or as fast as I would normally allow. I only wanted to push his breathing a bit to see how he responded. Hard to tell. All the same, he was quite happy getting out for something other than a walk. The outing also christened his new doggie harness with white fur. It’s the same brand as his previous but with an addition. It removable bags! Even better! Both bags have pouches built in for water-bladders with tubes! They can be used to balance the load AND Loke can now carry his own water when Jens takes him out for the really long walks! Rather neat I think! Since Loke’s rolling walk was barely over 3 miles (3.06) and quite leisurely for me, it seemed sensible I should go for a proper exercise ride. I thought about doing the reverse grave mound loop, but it seemed too short. The Ulva/G. Uppsala loop also crossed my mind, but that felt a tad too long since it looked as if rain was coming. Rain would have been welcome through. In spite of the lack of clouds, the temp and humidity made it uncomfortable. Instead I set out to do the ‘Maxi Loop’. Maxi is the name of the large grocery I shop at the most. The first 4 miles is the same as the Ulva loop, but I turn left instead of right. So, I started out and took the usual way around the barriers in the middle of the cycle path. As I toodled carefully through the residential area, keeping my speed to about 8 mph so I wouldn’t run over any random children darting into the street. About 30 meters ahead, I saw something scurrying from someone’s yard and into the street. My first thought was ‘A rat!’. It seemed something pale was caught around its neck and dragging. Abruptly, I realized it was a hedgehog! The white thing around it’s neck and dragging along it’s side was just the paler body coloring of the underside. I stopped as it meandered across the road as calmly as if it were dark and I wasn’t there. I grabbed my iPhone and got up to see if I could get a good picture of it. It moved a little faster, quills coming up a bit as I approached. It still kept sniffing around for food. Finally it stopped with its back to me, quills bristling and hissing. Standing perfectly still and quiet, I waited. After about 10 seconds, the quills went down and the little animal turned to look up at me and I took the photo. Happy, I retreated to leave it in peace. I did wonder if it was sick since hedgehogs tend to be nocturnal. I was thrilled. My first ever wild hedgehog that was still alive. I’ve seen a few squished ones, identifiable only by the remains of quills, since I moved to Sweden. It was wonderful to see a living breathing one. I used to have an African pygmy hedgehog for a pet. A mean little critter. Quiet disappointing since all my friends’ hedgehogs were adorably sweet. For being a pygmy, she was about the same size as the one I saw today. I flopped back into the trike and took off. My average speed was around 11 mph. Most of the hills, I managed to take at no less than 6 mph except the three really steep ones on the route. There were long stretches I hit and maintained 15 mph and if I had at least a -1% slope, the trike raced between 17-20 mph with a steady cadence of 85-90. As I came down one long hill, wheat fields to either side, about 100 meters at the bottom of the hill, I saw something sleek come out of the grain and trot purposefully to the middle of the road. About the time it saw me, I recognized the ‘cat’ was actually a fox. After freezing in surprise for a few seconds, it bolted back into the wheat. Even if I hadn’t been streaking along at 17 mph, I wouldn’t have had time for a photo. Definitely a good time for the GoPro camera. I desperately need to find a way to mount it in a good position.. Seeing the fox made me smile. Soon I was cruising along the 72 back toward Uppsala. I headed for the cycle paths behind the pet store there. That was fun! The narrow little track through densely shady trees with surprise curves as I spun the pedals to maintain speeds of 15-17 mph. It felt like the trike nearly tipped at one point. Soon I was steaming up the hill to the path leading to the ‘wooded hill’ of the field loop from the back way. Much to my surprise, it’s been paved! 5 years or so, I’ve known about that trail of gravel and dirt, riding it at least a few times every year and now it’s paved! That will be handy come the next thaw since snow and ice clear from paved surfaces much quicker than dirt/gravel. The path through the woods on the high hill has always been paved though cracking and patched on the far side. I climbed upward and it didn’t seem as difficult as I remembered. My speed even stayed above 5 mph which might be a first! Cresting the crown, I went to swap to my middle chain ring for the roller coaster ride down only to discover I’d never swapped to the small ring. That felt good. Not only had that 8-9% grade felt easier, it had felt easier in a higher gearing! I guess the day of suffering with the trailer on the failed tour has a silver lining. After that, it was a quick 15 min along the shady dirt path to the vicarage, along a busy road (via pedestrian/cycle path) before following a tributary to the river path and home. When it was over, I’d been out for 1 hour 15 min for 12.47 miles which might be a record for me given what hills do to my average. The wind had been considerable and against me for much of the way. I’d spent nearly 5 min cooing over the hedgehog. Another 5 min stop was spent fighting with my helmet when I’d thought to take my cap off since it was so cloudy. Wind coming through the vents in my helmet would have felt sooooo glorious in my hair. I changed my mind since the cap was keeping my hair in a pony tail. The thought of all that hair sticking to and wrapping around my sweaty neck… *shudder*. It took me a bit of fiddling it get it settled again so the chin strap wasn’t strangling me. Kinda irritating though. 12.47 miles in just a smidge over 1 hour. Last failed tour? 24.1 miles which took me 7 (yes, SEVEN) hours and left me broken for days. I could blame it on the trailer with 30 lbs of gear, water, clothing and food being dragged over wet, unpaved, slightly boggy road through a landscape that kept going UP. I also probably lost about 1.5 to 2 hours crouching under my umbrella during the pounding rains. Even so! The idea I could have covered 24 miles in just over 2 hours today made me fume over that failed tour all the more. Ah well. Life goes on! I got to see a wild hedgehog very close up!!! Well, it took a bit of doing, but I persevered in planning another tour. Getting packed for it became another challenge. I’m not sure why, but I just didn’t have the ‘oomph’. It didn’t help either that I couldn’t get the route settled. First, I was having a fit with that area I rode on the 12th. That conflict with the E18 and not wanting to add another day just backtracking to get across that aggravating road. Happily, the ride on the 12th corrected that problem. It meant completely remapping my route east of Västerås, but I did it quite gladly. I’d also actually planned to do the first day with Loke and then have my hubby pick him up sometime during the 2nd day. Sadly, that was not to be. I remapped that first day’s plan to add more distance since I supposedly could ride faster and further without the fuzzy one. Why couldn’t Loke come? Recurring problems and a new one. He’d started giving indications that the glands in his nether regions were acting up again on Wednesday and then again during the ride on the 12th, so I had already planned to make a vet’s appointment Friday. Friday the 13th was not a good day for Loke. But there was another thing I was definitely going to get checked. Loke’s breathing. 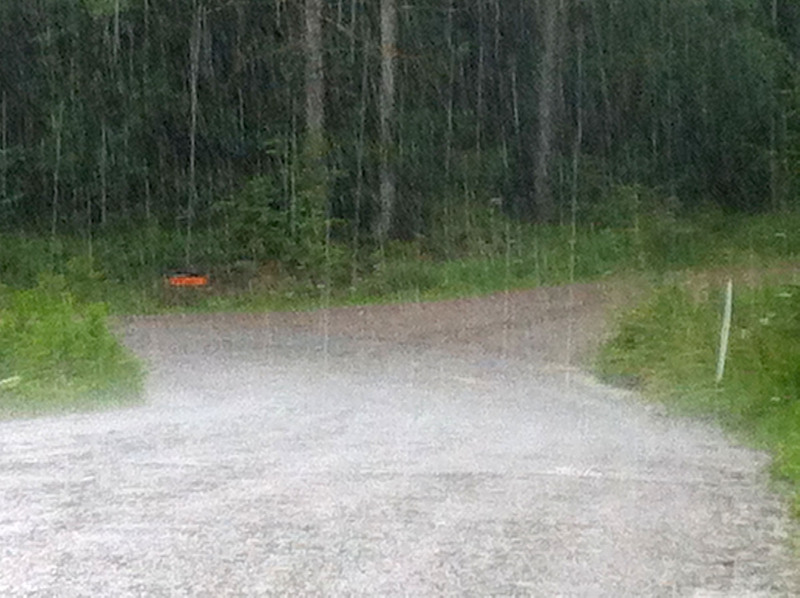 We’d finished the ride at Ängsö Castle and while waiting for Jens, I kept hearing this strange, but very faint whine. It sounded like a small dog far off in the distance protesting being left alone I thought at first. Listening harder, I realized it came from Loke every time he exhaled. It was just as well. Friday morning, I noticed Loke’s breathing was a little off. I couldn’t quite put my finger on what was wrong about it, only that it wasn’t normal. So, I called and a new vet tech (or maybe intern) scheduled me for an appointment just an hour later. First Niclas checked Loke over and found, yes, his glands had acted up again. He had a faint bubbling sound in his lungs as well. So, first Loke had to lay still in a scary room under the terrifying x-ray machine without sedation. He was a very good boy and stayed still when I told him to, praising him all the while. When Niclas said there was no immediate concern in Loke’s lungs, Loke was sedated for the rest. Then he spent the rest of the day groggy and unhappy. Niclas said he should get at least a week’s rest for his breathing which should clear up with the injection Loke’d been given. I still really wanted a tour under my belt and Jens’ vacation time was ticking away. So, I got into gear and managed to get most things packed on Saturday. Still had a few things left to finish up Sunday morning, but I made it and soon we were driving toward a church north of Västerås. A rude surprise presented itself as we took the 67 north. Immediately leaving the church, the plan took me on about a mile of the 67 before making a westward turn. I’d checked Google Street View several times. It showed a busy road, but one with a nice wide shoulder. Work had been done on the road since those photos. It was now a carriage way forbidden to bikes. 3 lanes of 70 mph (though many drive faster) with the third lane alternating between the two directions to give brief opportunities to pass. No shoulder and with guardrails not only between opposing directions, but often right along the shoulder-less right side as well. No room for cars to give a cyclist space even were it legal for bikes. Frantically, I spent the last few minutes to the church looking for an alternative in my map book. I found one. It would mean heading southward to a place called Skultuna, then cutting back northeast to rejoin my route at Svanå. I was grateful that the lead gray skies with drizzle had broken up and the rain stopped when we arrived at Romfortuna Church. It was a pretty church though without runestones. I was disappointed it wasn’t open. I got spoiled during the last ride with so many churches open to the public. Loke seemed a little sluggish as Jens walked him. I felt a little surprised at my emotional reaction as I faced a tour without him. I was going to miss his companionship. Worse, I had that strange knee-jerk reaction that I was the only one who could take care of him properly mingled with a sort of panic that I’d return home to find him falling to pieces. It didn’t help that his breathing was still off. I even got a little teary. I felt a bit guilty reacting more strongly to missing Loke than my husband. Of course, I’m accustomed to Jens taking his business trips and he’s out of the house for long hours most days of the week. The number of times I’ve been out of the furball’s presence overnight or longer can be counted on one hand with maybe even a finger to spare. I felt a little embarrassed by the welter of emotions about leaving the furry white one for 1 or 2 nights. I knew it was silly to think he’d go to pieces without me, but emotions rarely respond to logic. Jens on the other hand kept saying he was going to miss me and it was going to be weird in the apartment overnight without me. Then I was kissing the hubby bye and hugging Loke who had jumped into the now empty back of the car to lay down. He bounced to his feet, a look of puppy-eyed disbelief on his fuzzy face, as Jens closed him in. His heartbreak was palpable when he understood he wasn’t coming with me. My vision got a little blurry again. If I’d known how the ride was going to turn out, I’d have called Jens right back and thrown everything back into the car. I started down the road toward my uncharted turn to avoid the carriageway. I ran into aggravation right away when I stopped within sight of the church to find the road I needed on my Garmin. While I could see the road in my map books, I was having less luck with the GPS. There were enough roads in the area and close enough together the overlapping cluster of names obscured the actual image of the roads. I sat on the roadside fighting with the thing for 10 min, trying to find a way to turn the names off since zooming out hid the way I was looking for because it was too minor. Not an auspicious start to a tour. I did find what I was looking for. An unpaved road with a hard-packed surface and surprisingly few rocks. Potholes were scattered here and there, water-filled and reflecting the gray sky. Few and widely spaced, I easily avoided most. I’d been very careful with assembling and loading the trailer, but saw no reason to subject it to more impact than necessary. A couple miles later, I began to wonder if the breaking up of the clouds had been a good thing. Granted, the flat, featureless lead gray drizzling on us for half of the drive to the church had been dreary but not nearly as worrying as heavy, multi-shaded dark masses developing around me. I wasn’t certain, but at times I thought I perhaps heard a distant rumble of thunder over the sound of wheels on wet dirt. I had another problem too. I desperately needed to answer nature’s call. After little more than 2 miles on dirt, I arrived back on pavement. The dirt road had been smoother than most pavement so my time didn’t improve much. It was nice to not worry about potholes though. About the time I saw the steeple of Skultuna Church over the tree-line, I discovered something horrible. A dead badger. Sad as that was, the smell was worse. Clearly it had been dead for some days, rained on and rotting. Stuck with a 3% slope while dragging the trailer, I just couldn’t get away fast enough. Good thing I’d had so little to eat or I might have lost it. The next intersection joined a road running north-south. South was Skultuna’s church and north was the little town itself. I hurried across to the cycle path before looking at my maps. I decided to wait on the church. The western part of my tour was nearly one large circle. Just 5 miles would have been missing to close the complete loop if I’d been able to take the more northern road I’d originally planned. With the adjustments necessary to avoid the carriageway, I’d had to come through Skultuna and would come through again. Just the half mile to the church would be lacking in the circle. I followed the cycle path through the town. My only detour was to quickly lock the trike outside a cafe, run in for a desperate bathroom break and buy a soda so I didn’t feel guilty. I should have bought a sandwich instead of soda. Hindsight. Less than 20 min later, I had to go again and, as before, couldn’t find anywhere I felt secure doing so. I have an aversion to leaving my trike on the road and/or public displays of certain body parts. Everything seemed to be fields or tangles of undergrowth so thick it rivaled the deepest Amazon jungle. I would have had to carve my way in and lacked a machete. Teach me to try staying hydrated on a tour. The clouds grew more threatening the further from Skultuna I went. Then came the time where all doubts I’d heard thunder were removed. Flashes of lightning and a good solid crack of sound seemed to come from overhead settled any uncertainty to such questions. With nothing but fields to either side and my little flag the tallest thing for a couple hundred yards got my heart racing. As I write this, it occurs to me that for once the scenery wasn’t marred by the presence of a single power line. Bad timing for such a rarity though I have my doubts about relying on an electrical line and pole to attract lightning instead of me. I know lightning can jump from one object to another as well. By some miracle, the rain held off for a bit longer. It didn’t hit me until I reached the Svåna Bruk environment. I stopped to take a picture of the road running beneath the trees. As I put the camera away, the gray veil of a hard rain fell across the fields and trees to the west. They became increasingly hazy as the front edge approached. I watched it come, resigning myself to riding wet. I suddenly changed my mind. The idea of dealing with wet clothes in my small tent with my new sleeping bad lacked any appeal. I grabbed my umbrella as the first few drops pelted my legs. The road wasn’t the ideal spot to wait out the rain while hunched on my trike beneath the blue canopy of shelter. Just ahead I could see the gate of the Svåna manor house. I pedaled the last few yards to sit in the gravel. It worked surprisingly well. I had to hold the umbrella with one hand so it didn’t fall forward to obscure my view, but otherwise, no problem. I’d been hoping for a bathroom at Svåna only to be disappointed. The buildings were private residences and even the manor house had a ‘Private Area’ Sign next to the gate. I settled in to wait the rain out, glad to have my trike. Even with an umbrella, a bike with no place to sit while waiting out the storm would have been miserable. After a bit, I pulled out my Kindle to read with the spattering of the moderately hard rain just inches above my helmet. When it finally began to ease, I thought to take a picture with the iPhone to share with friends and family before putting the umbrella away. Except my feet and ankles, I was wonderfully dry. Another few yards on, I found the räckhammar. Quite impressive though hard to tell without something close by to give proper scale. Boggles the mind that water provided enough power to raise that big chunk of metal. Just beyond the hammer was the turn to Ramnäs. After the rain, I was less than thrilled to find it unpaved. The impression I had from my map books was of a road about the same size as the I’d ridden to Svåna. With few other options that wouldn’t add many, many miles, I took it. Are we sensing a theme to this ride? This one was worse than the first unpaved one I’d taken. It looked firm enough, but in less than 15 minutes the difference began to tell. The surface was less packed and with the recent watering it had become slightly boggy. Dragging the trailer over it felt like an extra 100 pounds had been added. There were more slopes and all of them seemed to be up. In some parts loose stones added to the effort. The cherry on top of that merry hell was my screaming bladder. Traffic passed with surprising frequency for such a small unpaved road so I didn’t dare leave my trike where it might be hit. Why I think it would be more likely to be hit without me on it, I have no clue. The issue with fields and forest remained particularly with the traffic. Only now, water dripped through the trees. It gurgled and splashed in the ditches as I struggled uphill. Nature itself mocked me. 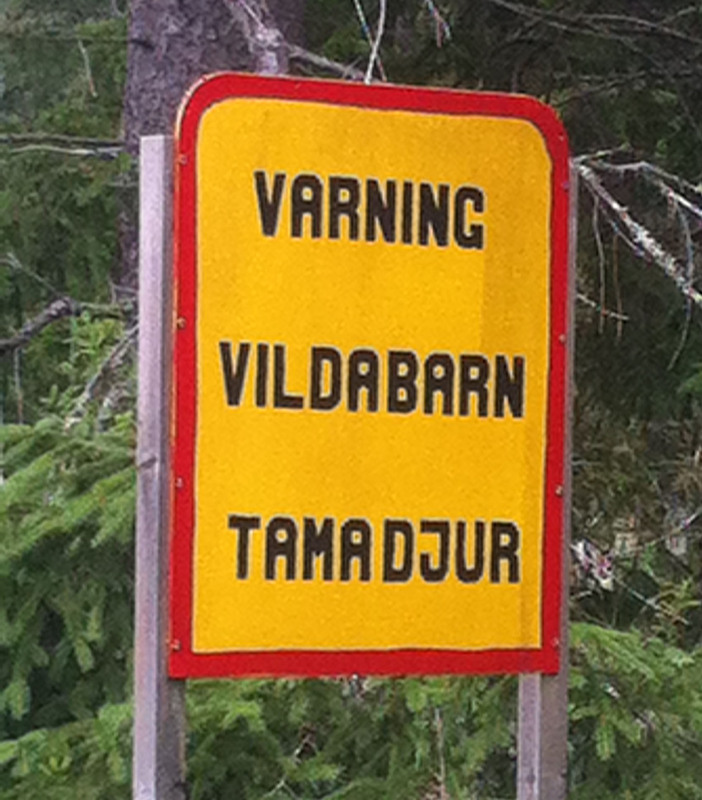 For Non-Swedish Speakers: Warning. Wild Children. Tame Animals. A moment of humor offered a few seconds of relief. Slogging up a hill, I saw a sign like many posted to warn drivers of playing children. This one attempted to be entertaining about it and certainly got a breathless laugh. Just past the sign, another cluster of clouds began to drop rain once again. At least this one was blissfully free of lightning and thunder. I put up the umbrella, but this time decided to keep going since I couldn’t go very fast and there was no wind. A house stood at the top of the long slope. In the fenced yard, a man played badminton with this son. They stopped on seeing me. The man gave a hearty laugh and said something along the lines of ‘How cool!’. Then he looked up as the rain came a little harder and asked if I was okay. I answered I was a little wet, but otherwise good. They waved bye and wished me good trip as I began to roll faster on one of the rare downhills. The muddy road kept me from going very fast, but at least I didn’t have to pedal for a few seconds. Such moments were to be sweetly savored on this ride. Then the rain came with a vengeance where the road forked. I decided I had to stop and hunker down to wait out the worst. It didn’t match the downpour on the Klarälvbanan, but not far off. It began to get through my umbrella’s fabric. I spotted a clearing about 20 yards past the fork. A graveled spot crossed the ditch to give easy access and just enough space for me to nudge the trike off the road. The grass in the clearing had been cut recently, meaning probably about a week before. Picnic tables and a couple of stone seats were scattered around. I stayed on the trike. The chairs and benches were wet, my trike seat dry. I took out the Kindle again though I had to prop the dry sack I carried it in over the top to protect it from the drips. I also found myself tucking my feet as close as I could to the crossbar of the trike’s body in an attempt to keep them somewhat dry. That may have been the beginning of the end for the ride. It felt a little uncomfortable in my right hip, but not enough to make me stick my feet into the rain. After about 40 minutes, the rain stopped abruptly. I got up to stretch, having gone a little stiff during the wait. I realized I hadn’t seen a single car the entire time I’d sat there. Trees mostly screened the turn where most of the traffic would go since the other way led to a dead end. I actually ran to the most hidden part of the clearing. Wouldn’t you know it? As I answered nature’s call, a car came. Mostly obscured by a tree and a table about 30 feet away, I don’t think they could see anything even if they had craned their heads around to look behind them. At least it was one less discomfort as I went back to the trike. There still was the road and hills to deal with. I kept telling myself it would be better once I reached pavement. The last mile of that cursed dirt road was the worst. Looser soil turned to mud with plenty of loose stones thrown in for good measure. My prediction of better going once I reached asphalted surfaces again was right. For about a mile. Then the climbs began. After the dirt road, I had little left. I crept upward at a crawl with screaming thighs. And curse it all, I had to pee again! I was too exhausted and miserable to notice the scenery let alone enjoy it or think about taking pictures. I came out of my pedaling daze only long enough to briefly watch a family of cranes. I would have taken a picture of them if it wouldn’t have required swapping lenses. I just couldn’t be bothered. One climb stretched nearly unbroken for 1.5 miles. The closest thing to respite were the moments it eased to a measly 3% grade as opposed to 7% or more. Somewhere during that nightmare, my right hip gave a pop. I froze, waiting, but the pain didn’t come. That came subtly at first and then worsened with each turn of the pedals. At least the rains had stopped for the time being. The sky even looked a bit kinder, less menacing. Small patches of blue made brief appearances. Finally I reached Ramnäs Church. On my trike, I searched for a bathroom, but couldn’t find one. There might have been one in the church and I saw it was open. I almost went in until I realized Sunday evening services were being held. It’s one thing to go walking in dressed for cycling when it’s open to the public. Another to do so when people are in their Sunday best and listening to a sermon. I also didn’t want to walk down that hill only to find there was no bathroom at all. As for runestones? I pulled out my trusty iPhone and did an internet search. Ramnäs Kyrka runsten found nothing. Between my luck with runestones in the area thus far and the lack of finds via Google, I was more than happy to bet there were none. It saved me a walk (or pedal) back up that hill. During the little break here, I also took pain meds in hopes of easing my hip. Somehow, I even found the will to continue. To think, I still had the delusion this would be a tour. I don’t remember much about the ride between Ramnäs and Sura Church. Maybe just a few dazed recollections of more nasty climbs, but also a few down runs, hanging onto the brakes to protect my trailer. It lists a max speed of 15 mph. I’m pretty sure 30 mph would be pushing it though I did coast down one hill at 20 mph. I was starting to feel a bit stressed when I saw the steeple of Sura Church over the trees. It meant entering into a more populated area as it came up on 6 pm. 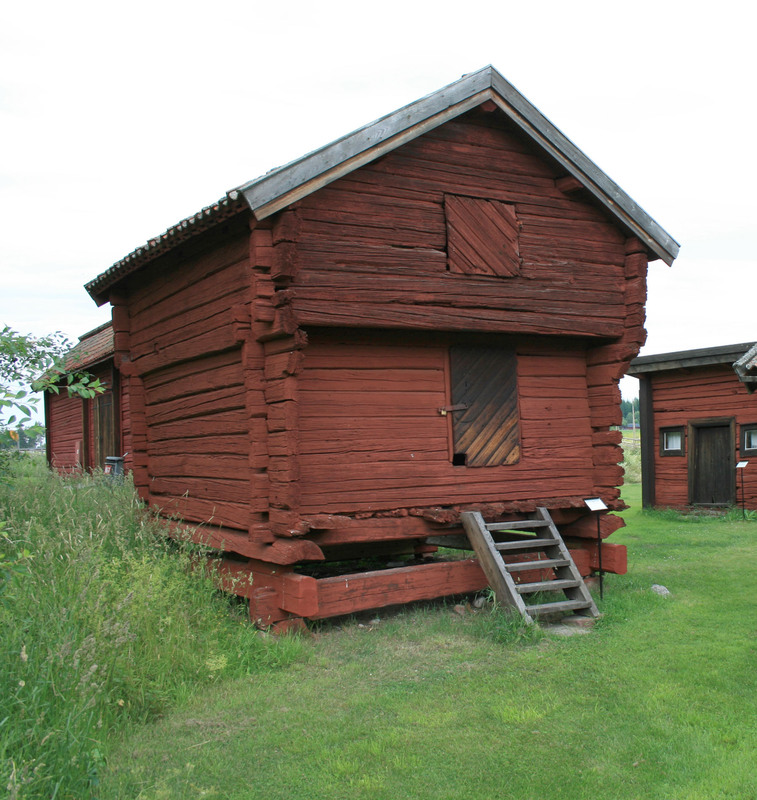 There had been too many houses and such just on the stretch between Ramnäs and Sura to camp. On the fringes of Surahammar, it could be even worse. Still as I saw the distinctive stone wall that surrounds just about every old church in Sweden, I had a burst of energy as I pushed up that last hill crowned by the church. It stayed hidden behind trees for a time until I wondered if I’d taken a wrong turn. When the road finally led me past them, I was stunned. Sura Church was one of the most beautiful ‘country’ churches I’d ever found. Danmark Church is beautiful, but Sura was a whole different style that took my breath. Passed the parking lots stood a sign forbidding bikes on the paths leading up to the church. Lawless rebel that I am, I thumbed my nose at their rules and pedaled on. Or it could be exhaustion made me defy authority. Cycling, even with a painful hip is almost always easier than walking. It didn’t save me from getting up out of the trike seat though. With the gorgeous stone foundation and lovely detailing of the exterior, I wanted to get as much of the church in frame as possible. I also wanted to capture it in a single photo rather than pray I could photoshop two parts together into something reasonable. As it is, I seem to be trying to fix wonky photos quite a bit. It seems like every church I photograph lately has a slight fisheye effect. I wonder if they’ve always been that way with my current lens and I just didn’t pay attention. Even this one I had to fiddle with the ‘Adaptive Wide Angle’ filter in Photoshop. When I showed the unaltered version to Jens, he was baffled. He did say my standard lens is probably bottom rung since it’s the one that came with the camera. He’s suggested I do research to find a decent mid-range one to replace it. Isn’t that sweet? Exhaustion weakened me as I wrestled the trike around and coasted down a hill to a small building where I hoped I could go to the bathroom. Unfortunately, it was locked. Things did look up from there. It was a quick quarter mile down the church hill followed by a nice level cycle path. The path didn’t last long, ending at a side road. At the end of that short little drive, I saw a cycle/pedestrian sign at what looked like a bridge. Wearily, I headed for it. The bridge crossed the Surahammar canal! As a matter of fact, a closed lock blocked the water above with a wet cascade squeezing out the edges in a gurgle. Just beyond I saw what had to be about the best sight in the world. An outhouse! It was unlit with no skylight so nearly pitch dark inside. Instead of a deep earthen pit it had bucket and smelled, but I was desperate. After that, I noticed I’d found what was probably the best camping spot I’d seen all day. Smooth cut grass lawn with not a rock or root to be seen. The gurgle of water through the canal lock to lull me to sleep. I checked the area for signs forbidding camping but it seemed clear. Notta house to be seen and tucked back from the very quiet cycle path. I finished my limping check of the area. I bent to take the cover from the trailer and saw stars. That was it. There was no way I could stoop, bend and crawl around to put up the tent and arrange my bedding. I didn’t even think I could handle getting in and out of the tent. If I’d been hurting that badly without taking a max dose of pain meds, I would have given them a chance to work before deciding something. Since they were already in my system for an hour I shuddered to think how bad the pain would have been without them. I think Jens was secretly glad I called for pickup. He’s nothing but supportive of my desire to tour so not a discouraging word has passed his lips. He wasn’t even irritated by an extra 3 hours in the car for the trip to Surahammar and back. I recovered the trailer to force myself to pedal on. I needed some place Jens could reach me. No hills. What a blessing as I crossed another bridge into Surahammar proper. Within minutes I saw a one of the historical/cultural signs for Stenhuset. It was right on the corner. I coasted through the parking lot and into the heart of the tiny little open air museum. With my Apple and cherries in hand, I went to a picnic table to nibble and begin writing this post. When Jens arrived about an hour later, I needed a lot of his help to load the trike. Loke alternated between being cuddly-happy to see me and wanting to mark every bush, post, tree and rock in reach. Relief filled me as I slumped into the car seat with the heat turned up on high. The day’s ride had been pure hell dominated by my hyperactive bladder, sucking mud and hills making the trailer’s weigh 1,000 lbs, tortured muscles and scary moments with lightning. Disappointment at failing to make a tour of it warred with joy of its end. The joy won. I dozed all the way home. This morning I can barely walk though my hip feels a bit better. Most of the pain is in my thigh muscles which is an improvement over yesterday evening. I’m feeling a bit disheartened, but odds are I’ll be attempting it again soon. I guess cycling 41 miles on a nearly level paved cycle path didn’t come close to prepping me for dragging the trailer in those conditions. I have to wonder how much easier it would have been if Loke had been at my side. Not just his company during my misery, but I suspect he pulls a bit more than I ever knew. Likely he’d have gotten me to smile and maybe even laugh more. Hopefully he’ll be back in the traces soon. Last winter during my end of year post, I reported 52 rides for the 2011 cycling season. Wednesday’s ride made 52 rides for 2012. Granted, it was just a 6 mile blast around the grave mound and river loops at a 10 mph average. Quite brisk for me given how I creep up hills. Also, it ticked me over 400 total miles for the year. So, I guess it’s kinda good my hubby bulled me out the door for a solo exercise ride. With my tour delayed thanks to minor problem with my right ear requiring a doctor’s appointment on Friday (today), Jens again bullied me to plot a day ride somewhere. Another of those ‘I’ll drive you anywhere within reason, no complaints’ outings. I picked the area south of the E18 between Västerås and Enköping. That spot has been making me crazy as I attempted to work it into my tour. A number of churches and even a manor house/castle. The problem is it would have required a huge double back of 20-30 miles to get back to things I wanted to see on the north side of the E18. The idea of an entire day spent re-traveling recently covered ground made me wince. Making a day ride of that area was the perfect solution! I woke early to plot and print my maps of a 30 mile route then organized everything. By 8:10 am we were on the road. The weather caused me a bit of concern. The on-line weather reports showed a very miserable day. Lots and lots of rain. As we drove west, it looked pretty gloomy at first, but then the clouds broke a bit and it turned pretty. The phrase ‘Changeable as the weather’ was never more true. Minutes before arrival at Irsta, the clouds became quite dark and thick. As Jens parked, it sprinkled. I jumped out, intending to get pictures of the church before it started raining any harder. As I opened the back hatch of the car, the bottom fell out. Fortunately we had umbrellas packed. We both were dismayed. With a startled Loke, my husband ran for the lychgate’s meager shelter. He said there was no way he was going to let me start my ride in this. We’d go back home. I was grateful for that much. It’s one thing to get caught in storms. It’s another to begin in one. Juggling umbrella and camera bag, I marched through the torrent to find a good angle for the church. Though it had been raining for less than 2 minutes, waterfalls cascaded from the church eaves as the gutters overflowed. With so small a church yard and raised up on a hill as it was, finding a spot where I could frame the entire building gave me quite a bit of difficulty. During the walk around, I discovered a little bathroom building just outside the walls. Wouldn’t you know? As I came back out I found the best view to get everything in frame! The rain also had eased to a steady fall rather than a drowning flood. My husband suggested we wait half an hour to see what happened before completely packing it in. 20 minutes later, as water still pattered off soaked leaves, I assembled the trike. Loke seemed oddly apathetic as I loaded pod bags and water. Jens insisted I do a loop of the parking lot without Loke to see if it perked him up. It did. As soon as the wheels rolled, he rushed to the side of the trike and followed his running bar. Saying farewell to my husband, we were off. The first turn came just yards from the church parking lot and put us on a much lower trafficked roadway. Tongue flopping, Loke ran with his usual exuberance. I’m ‘Panorama Obsessed’ now. Can you tell? He had about a mile and a half to burn that initial energy before hills and beautiful views begging to be photographed slowed us. With the sun out more, the heat became a bit uncomfortable. It wouldn’t have been so bad if not for the climb. Between Irsta and Kärrbo was a gentle ridge or just a higher point in the landscape like a sort of plateau. Either way, it meant slow going without much wind to cool us. The worst were the flies. Admittedly, they were no where near as bad as they’d been in the Gysinge area. They weren’t horseflies, but the smaller swarming kind I didn’t think bit. How wrong I was. The bites hurt only as much as a mosquito, but they had a higher annoyance factor as quite a few of them went straight for my eyes. They had me flapping my hands around like a frantic chicken to keep the d*mn things out of my face. Little more than 4 miles from Irsta, we rounded a turn up a hill to pull into Kärrbo Kyrka parking lot. With a few visitors in the church yard and the fact Loke hadn’t ‘done his business’ yet, I left the fuzzy one tethered to a shady little tree with a full dish of water near the trike. Kärrbo is a simple looking church that still possessed much of its medieval character. Disappointingly, no runestones were to be found, but there was a mausoleum built onto the side of the church which had a little sign. Members of the Gyllenstierna family were buried there from the 1650’s until 1840’s. You can see the mausoleum just above the tall gravestone in the right of the photos. Of course, there is a little more info about the church with the click of a thumbnail. Loke awaited me impatiently as I finished my stroll. I gave his feet a quick going over and they looked fine. A bit of water remained in his dish which I used to soak his ears. Leaving the parking lot for the northward trek to the next church, he pulled the trike into a flat out run and I pedaled fast enough to give him slack. Less than 2 miles later, I came to a choice. The road ended at a ‘T’ junction. I’d mapped left, but a sign to the right, indicating a place called Lindö 3 km away, had the loopy cornered square indicating a cultural/historical site. I checked my mapbook which offered no clues, but since the outing was about enjoying a day long ride rather than getting from point A to B in X time, I decided to risk it. The road was unpaved, but one of those nice ones where the earth is well packed and smoother than most asphalt surfaces. The recent rain had left it a ever-so-slightly mushy, but barely enough to impact our speed particularly with the gentle downward slope to the river. Loke was thrilled. Earthen tracks are his favorite. He would have been happier with a narrow forest path scattered with leaves and densely shaded, but this was the next best thing. Rocks, even in the center line, were few so I let him go as we dodged the occasional collection of shallow potholes. That bit of nice road lasted only about a mile. The next sign pointed up to a shade-topped hill where the rock-strewn path vanished under the arching branches of trees. I almost turned back there. The distribution of the rocks was dense enough to worry me about Loke’s feet since the ground was way too wet for socks. It even looked hazardous to my rear derailleur in a few spots. All that risk for Lindö Tegelbruk. Tegel is ‘brick’ and bruk translates roughly to ‘works’ and at times can also mean ‘factory’ or ‘mill’. So, a brickworks. I’m not sure why I decided to go for it, but I did. We took it slow and I did all I could to give Loke the least rocky spots. I needn’t have bothered. The next indicated spot was a track of mostly flattened grass. Granted, my GPS indicated it, but ahead just looked like a residential area. Did I really want to face stony ground for what might be little more than a clay pit? Excuse the bad iPhone photo, it really didn’t like this lighting, but this is all I could see in the distance. It looks distinctly like a little country house. My willingness to search for the brickworks came to an end. Rocks are bad enough, but I have to be very careless and unlucky to damage my trike. Grass on the other hand can be a headache even when trying to be careful. A stray stalk can get caught in the tiny cogs of the derailleur and wrap tight until it interferes with the chain. Getting that undone could be a 15 – 20 min greasy struggle. I turned back. Loke and I both were glad to see the nice dirt road again and we made very good time in spite of the 3-4% slope. Just Love This Little Building! Traffic was sporadic but friendly as we headed north. Every car had at least one person who smiled and waved. A farmer on what appeared to be an antique tractor called out ‘What a fine dog!’ as he chugged across the road from field to farm yard. A pair of spandex clad cyclists on road bikes whizzed by at 18 – 20+ mph with huge grins and thumbs up. The landscape was beautiful. Admittedly, not much forest, but most of the trees around were older growth. Very few weedy saplings and, thinking back, I don’t recall a single clear-cut. The gentle rolling hills with fields green under a July sun gave the impression of age. It felt as if man had established the character of this landscape centuries before and now, maintained it in a harmonious balance with nature. The next turn brought Loke and I back to the road running almost directly between Irsta and the next landmark on my list, Kungsåra Church. Barely 3 miles between Irsta and Kungsåra (King’s Oar), yet by the time I could see the steeple of Kungsåra Kyrka through the trees, I’d ridden 11 miles and enjoyed every minute of it. Well, except for the rocks while looking for the brickworks. The road between Irsta and Kungsåra was one of the busier ones and not much of a shoulder. It wasn’t nearly as bad as expected though. The few times I’ve ridden on the 72 just outside of Uppsala were far more harrowing and traffic was lighter than that with the usually polite Swedish drivers, so it Loke and I were fine. I spotted a sign for Kungsåra Djurparken with indicators for food and camping. The thought of a cafe actually appealed to me. Imagine that. Food sounding good while on a bike ride. Given how I generally survive on 200 calories or less for a 10 hour ride with no feelings of hunger, that was surprising. The church came first. It stood at the top of a hill, a brutal climb. At least it was mostly shady and Loke helped. At the top of the hill, I coasted into the dense shade of trees growing next to the church yard wall. A strip of lush grass grew between wall and a patch of gravel where I coasted to a stop. A nice spot for Loke to rest with a handy sign to tether him. I gave him plenty of water and went photo hunting. I heard the sounds of work around the church, but saw nothing as I began my walk clockwise through the church yard. As it had been at Irsta, finding a good angle, clear of trees but with enough space to get the entire church in frame became a challenge. Passing the tower entrance while searching for wall-embedded runestones, I stopped and looked the door. A small sign, barely larger than my hand hung from one of the nails. ‘Open 10 am – 4 pm’. Though curiosity pulled, I felt terribly self-conscious about going in with my cycle shoes, sweaty clothes and smelling of sun-screen. Tentatively, I opened the door. The porch entryway was mostly white and simply decorated. Not a sound to be heard except the faint scraping sound of the work outside. Opening the second set of doors, I found the church empty. The white and pale blue of the pews and the starkly rendered walls gave the interior a rather cold and modern feel. A bit unwelcoming in my eyes. Hints of an older age could be found once past the shock of finding something so contemporary. The ancient alms box with the rusty, hand-made hinges and bands caught my attention right away. The pulpits in Swedish churches are almost always spectacularly and beautifully carved, painted and covered in gilt and this one was no exception. There is also a very old baptismal font from the 1200’s. A royal pew sat beside the font with dragon head embellishments worked into the seat back. The original pew is in a museum somewhere, but this is an exact copy. A huge grin pulled at the corners of my mouth as I left the church. Such a little thing, but getting to see inside made me want to giggle. Runestones would have been the perfect topping for the visit there, but they seem to be a rarity west of Enköping. I laughed as I left the church yard. I’d given Loke nice thick shade and plenty of cushy grass to lay on and what did I find? The fuzzy one laying on the rocks. One has to wonder about the workings of the canine mind at times. Once I picked up his leash, Loke bounced to his feet ready to go. The tough slope we’d slogged up was like a ski-launch as he charged at full blast. I still had to hang on brakes to not drag him. Soon we were back on the busier road. Almost immediately I saw the animal park which had the ‘cafe’. It turned out to be a restaurant which would have been embarrassing to go into dressed as I was with the aroma of sunscreen hanging about me. A few horses stood in paddocks next to the road with the parking lot between them and the park’s building. Further along ran high wire fences. The kind that are generally used to keep moose and deer penned up rather than horses, sheep or goats. Those pastures looked empty though. That was when something strange happened to my fuzzy friend. At first, Loke seemed to go on alert prey-drive mode. Then he jumped, throwing himself desperately into the harness as if someone had popped him in the tail with a BB. I kept looking for a hare or cat, but saw nothing. Loke continued his wild run but with his head tilted and one ear cocked funny. In spite of the hard gallop, he managed to shake his head from time to time. I finally hauled him to a stop to examine the ear, but found nothing wrong. No extra redness or swelling I would have expected from such a violent reaction. I wanted off the busy road before doing more than taking a couple minutes to check him so we pressed on at his more usual speed. By the time I found a bus stop to pull over more safely, he was back to normal. All I can think is maybe he was stung by a wasp or bitten by a horsefly in that ear. The next stop was Ängsö. It’s an island separated from the mainland by just a few meters of Lake Mälaren. The island is quite pretty so a lot of scenery to enjoy as one travels to the castle and church there. Loke began to lag a bit by this point though we had barely reached mile 15. I slowed down and made sure his ears stayed wet, checked his socks. The ride wasn’t meant to be a race, but an outing for both of us to enjoy. Loke and I received more friendly waves on the way toward the manor house. One older man watched us for a moment with an open mouthed grin of delight before waving furiously. That smile was infectious. I still wore it as we went along a shady lane lined with old gnarled trees. We passed a white plastered stable-like building where a group of older men sat talking near one of the open doors. Just beyond that another sharp turn took us along a stone wall capped with terracotta roof tiles. Above those tiles thrust the steeple of the church. As the previous two church, I left Loke in the shade. I had to re-evaluate my definition of ‘small’ in regards to churchyards as I walked through the diminutive main gate. Less than 4 yards separated gate from church wall on one side. There was more space around the other sides, but not enough to get the whole church framed. The structure is beautiful with features I identify strongly with Gothic. Parts of it reminded me of Uppsala Cathedral and Danmark Church. I took as many photos as I could with the hope of being able to stitch them together, but my attempts came out wonky. I had to go someplace special for this picture. I’ll get to that later. This church was open to the public as well. Metal and glass modern doors stood inside the old ones. A lot of the old charm of its medieval roots were evident. Old floor slabs, even brick remained. A pair of old grave slabs stood before alter. There were murals too though much faded. Fortunately, I managed to get one pair of photos to blend smoothly without perspective distortion. I toyed a little with contrast otherwise the paintings would have been nearly invisible. The ceilings would be stunning with restoration work. I took my time exploring the church since I decided that I was going to end the ride and Loke was in a cool spot with lots of water. Afterwards I parked the trike where I could lock it. Loke came with me this time through a small gate in the wall too narrow for my front wheels. Loke trotted along, his tail up like a flag as he pulled out a bit of leash to forge ahead toward the open expanse of a graveled courtyard and old trees beyond. Nearly a dozen people sat at tables outside the front of the castle dining on waffles and other pastries filling the air with the sweet aroma. While wandering around, I found a path looping around the back of the castle. I hurried back to the trike to move it into the courtyard. I called Jens and told him where to find me. Loke made comfortable again with shady tree, plush grass and full water dish, I followed the wonderful smells coming from the castle’s main entrance. Before I made it to the kitchen, a dark opening drew me. I’d found the entrance to the dungeon. A sign pointed out that exploration of the castle was for paying visitors. Ballroom where the ghostly woman walks? Maybe! It cost 60 kr. I decided to risk it after seeing Loke had fox-curled on the grass into a sound sleep. A self guided tour walking through a castle to finish a ride? I paid and off I went. I had a laminated printout describing the paintings, but I didn’t have quite that much time. Just a quick stroll through the rooms to read signs and take photos. I noticed the stairs were wide and shallow as I climbed to the 2nd floor. A bit of decoration was painted on the stone at both ends of each step a bit scuffed and worn from centuries of use. Some of the rooms were simpler than expected and the beds were tiny. From what I understand they’re so short because the Swedish people (and maybe all of Europe) slept propped into a sitting position centuries ago instead of flopping down and stretching out as we do today. It was there on the third floor I found a beautiful view of the church through one of the windows. Naturally, I took a lovely photo of it. As I climbed, each flight of stairs became steeper and narrower. At some point they lost the decorations at the end. I think I remember them looking rougher too. As if they’d been hacked out and laid down rather than being worked and smoothed first. I was relieved to reach the top floor. After exploring, I hurried back down the stairs to check on Loke since I’d heard a dog barking. He was sitting up to look around. I returned the laminated list of paintings to the staff in the kitchen. The smells of cookies and pastries and cakes was too much to resist. I ordered a Belgium waffle! Jens arrived a short time later and we met back at the church parking lot. A happy Loke greeted my red-haired hubby and Jens walked around with him. The trike was nearly put away when Jens called me over to look at a grave stone. I’d noticed it when riding from the church parking lot to the castle courtyard. I’d been baffled as to why the person had been buried outside the church yard. Turns out, it wasn’t a person! A king’s horse no less. The rest of the packing finished quickly and we were on the road for home. I think my timing was perfect. Dark clouds came rolling in and between us and Uppsala awaited a fairly impressive thunderstorm particularly for Sweden. Lightning split the sky and lit the deep steely gray clouds. After the initial storm at the start of the ride, I’d been hit by no more than 3 or 4 drops of rain. Exploring castles and churches, Belgium waffles and I stayed dry! Yep. A new toy! First! Back-story! Three years ago, Jens purchased a fishing kayak. A very nice one I might add. We found storage for it and hoped to have many years of fun with it. Sadly, it was not meant to be. The storage solution was difficult at best, being remote and awkward to move it in and out of. The weight of the craft worsened the already difficult situation. Too heavy for Jens to manage loading on the car alone which certainly meant I would be unable to deal with. Between the two of us, we used it no more than 6 times, maybe as few as 5. I paddled around near Vik’s Castle one glorious day. A complete blast I might add. Then a couple hours in the Baltic near Singö. Jens used it once on our trip up to Storblåsjön, in the Baltic at least once and maybe a couple other times I can’t remember. We both loved it, but the fact it took us both just to load and unload it from the car proved too much a hassle. So, he asked if I’d be upset if we sold it. I assured him not and he set about finding a buyer. Well, someone indicated interest and after a bit of haggling, a price was settled with the exchange to made this last Thursday. Jens planned to wash it before the buyer came for it and his dad was going to help him wrestle it around. Jens’ mother and sister also were coming by for dinner that evening. So, our dinner guests arrived, dropped off by Jens’ father who felt too unwell to eat, but no red-headed hubby in sight. I was baffled, but happily chattered with my in-laws. 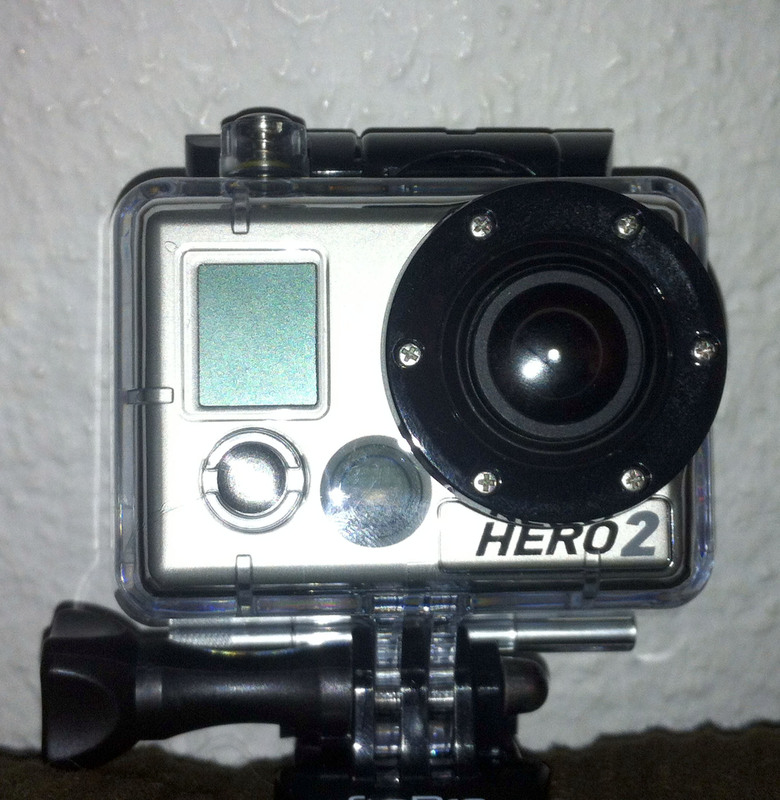 GoPro Hero 2 Camera – It came in a box of course. A curious glance within revealed a camera! A GoPro Hero 2 more specifically. A very small camera with a water tight case with many mounting options. It can do HD video or timed stills. We’ve been eyeing the GoPro cameras since Jens suggested it about a year ago when I’d mentioned how funny it would be to get videos of Loke doing the grass wiggle or when a herd of cows run along a fence with us. I’d been reluctant to go through with the purchase since there’s other things I’m also pining for. A new and much more comfy sleeping pad to fit into the pad pocket of my new Big Agnes sleeping bag for one. Just recently bought the camping stove. Throw in pricey 3D software I’m drooling over, the camera was well down a list dominated by things I deemed more useful and a bit less frivolous. Jens assured me he wanted it too since he saw a video made by a guy who strapped one to his leg while fishing. You catch a glimpse of his catch flashing by as he reels it in. I wanted to take a closer look at the new toy, but set it aside to be sociable with my in-laws. As he came to bed, Jens woke me long enough to say he wanted to go fishing at Gysinge the next day. I should plot a route near there to try the camera out. I thought it was a great idea when I came awake enough the next morning for conscious thought. I came up with two possibilities for rides and Jens naturally picked the one which would have me leaving from the immediate area he planned to fish. We made no rush to leave. We were on the road to Gysinge around 10:30 with a drive of roughly 1.5 hours. I love Gysinge. 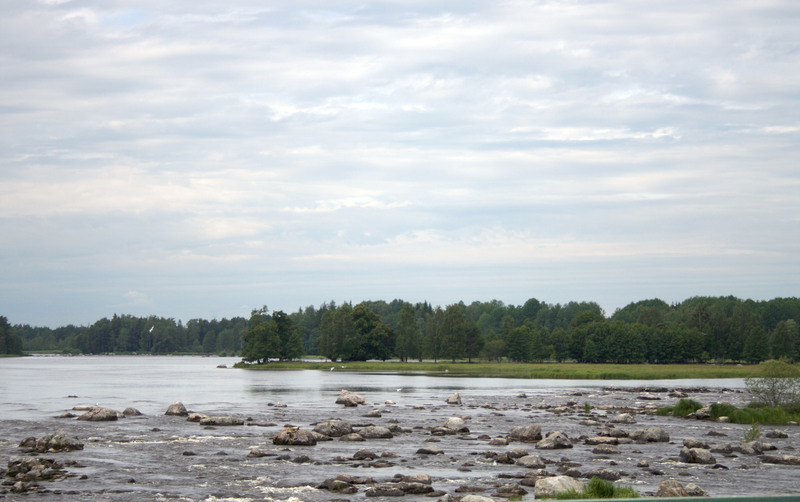 An island in a river surrounded with rapids with an old ironworks dating from 1668 to 1926 on one shore. The between the natural surroundings and the old buildings, it’s a beautiful location I enjoy. I’ve posted quite a few photos of the locale on the blog even though I’d never cycled around it, most from the winter as I did a filler post between cycle seasons. I was looking forward to riding the area finally! And if you can’t tell from the photo of the mill ruin and rapids, I’ve completely flipped for Photoshop’s ability to stitch multiple images into gorgeous panoramas. That leads me to a quick little side blurb about my use of Photoshop. I don’t use it for much. The only things done to my photos with it is cropping, panoramic stitching (new), sometimes rotate a couple degrees if I happened to be sloppy with aligning the camera to the subject and lastly – exposure adjustment. I cringe when I do the last. The ‘photo purist wanna-be’ in me feels I should buckle down and learn to use my Canon’s non-automated features. I guess that part reluctant to do digital retouching hearkens to the past age when film was the only option so you better know how to set white balance, apertures, select the proper ISO film and so forth. I know even professionals don’t blink an eye when it comes to adjusting their images now days. It’s just hard for me to embrace it. Photoshop and I have an uneasy truce. That said, I goggle with amazement at the spectacular results people can get with just a few tweaks of saturation and various balances. I’m even a jealous. I am a creature of complexity and contradiction it seems. My enthusiasm for the day’s plans suffered the first blows as I began to unload the trike in the handy parking lot a bit less than 2 miles from the grounds of the ironworks. Within seconds of stepping out of the car and opening the back hatch, they came. At first, I thought they were the hornets so common in Sweden. They certainly had the buzz and the coloring for it. It was little comfort to realize the heavy drone of wings supported blood suckers, each nearly an inch long and with a bite that hurt almost as much as a hornet sting even if the pain didn’t endure as long. Gnats annoy me. Mosquitoes I have a strong dislike of. The biting flies? Now those can freak me out. The parts of Mississippi where I grew up had small black and yellow biters we call deer files. They’re not very big, but they could get quite a rise out of me by sheer numbers. Horseflies, being larger, tended to make me jump and squawk just by buzzing by my ears, but panic didn’t tend to come until there were 4 or more of them. Sweden doesn’t seem to have the swarming equivalent of the deer fly, but they do have horseflies and some of them get very large. There I was, trying to unload my trike while flailing and jumping with not just a few inch long horseflies circling, but dozens. They hurt! I used a bit of repellent, but it didn’t seem to help much. Jens ended up watching my back as I got everything ready. I planned to keep moving as much as I could to avoid the swarms. In a rush, I dropped into the trike seat, turned on the GoPro mounted at the front of my helmet and went to take off. Immediately, Jens yelled, ‘Rear tire is flat!’ The second blow of the day. Turning the camera off and letting Jens take the hyper-excited Loke, I took a look. Fortunately, it was a minor malfunction of the valve which I corrected in moments. As an extra bonus, my big tire pump was in the car. Otherwise, I would have lost an hour to re-inflate with my little emergency pump. Back into the seat, Loke tethered to the trike once again and off we went, the GoPro taking video as we went like a loosed arrow. Loke ran flat out. I think he was as desperate to escape the blood suckers as I. Alarmingly, some of them kept up for a while. At 17 mph the 1.75 mile to the first of the bridges went in a blink. I stopped on each of the bridges to take photos of the river. My husband caught up and even stopped to walk out to us, voicing surprise at finding us so far along so quickly. The day was gray, but it was a blessing. I’ll refrain from saying it was hot, but it was unpleasantly warm particularly with the humidity. 75% – 80% at least. Uncommonly humid when it’s been two days without rain. Without the clouds masking the sun, I would have left Loke with Jens. As it was, I planned to stop frequently to water the furry one and soak his ears. The bridges were blissfully clear of the flies. So were the grounds of the Gysinge Bruk! As we rolled past and between buildings, I kept Loke’s pace more moderate. I also swept my head from side to side to let the camera on my helm capture images of the environs. People gave us startled looks, though one couple waved enthusiastically. I took a pause in between the buildings to offer Loke water. Then a little further on when I stopped for pictures, I discovered I’d left his dish on the ground. I hurried back to retrieve it before heading to the main road. The surface of the main road was pretty bad. Not much in the way of potholes, but that sort of surface where the bitumen has disappeared to leave the knobbly stones standing out which make for a rough ride and abuses Loke’s feet. After less than a half mile of leaving Gysinge, I stopped to sock the fuzzy one. Not fun. The huge horseflies were back with a vengeance. I tried using repellent, but they ignored my puny efforts to dissuade them and kept coming. Even when I blasted one directly. Every gnat and mosquito in view disappeared, but I’d have taken them all back to be rid of those files. Socks on Loke, we took off again. Both of us pushed hard in an attempt to escape. Loke snapped at a few of the flies as he loped. Quiet an impressive feat. I kept turning record on and off with the camera. The area outside of Gysinge seemed to be recovering clear cut with saplings between 4 and 12 feet tall. It still makes for boring scenery and I wasn’t that interested in getting video of my cursing and flailing at the flies. Our speed wasn’t even enough to elude them. 14+ mph and one mockingly buzzed in my face, keeping up with our pace for almost a quarter mile. It still had enough speed left over to dodge the hand I kept swinging at it. 4 miles of nightmare went under our wheels. I was miserable and hating the ride. I was hot from pushing so hard, highly stressed from the flies and concerned for Loke in the humidity and warmth. I was coming to the breaking point. That one where you stop what you’re doing and stomp around while yelling out your frustration. Not terribly productive, but sometimes it makes one feel a little better even if only briefly. As we came to the fringes of Österfarnebo, I spotted a sign for a cafe and cultural site. Knowing I was unlikely to come even remotely close to making the full mapped distance, I turned in search of the cafe. Thanks to a very mild wind blowing our way, it felt a little cooler once we made the turn. The direction change seemed to give Loke a new burst of energy and I let him run. While flies could keep up with us, the faster we went, the fewer there were. The cafe was located at an old farming village site which are so common. As we coasted down a hill and I parked near the fence. I took off my helmet and began to collect the things I won’t leave on the trike when exploring. Then I realized there were no flies. It was glorious! My lips wore a smile instead of a grimace as I gave Loke water, shook out my sweat-damp hair and strolled through the gate of the farm village open air museum. The place was well maintained with clipped lawn and all the buildings in good repair. I could hear voices from the direction of the cafe situated in one of the parstuga of which there were at least 3, maybe 4. The midsummer pole still stood near two of the cottages, the greenery which had once covered it now brown and withered. If you look to the right of the photo of the parstuga you can see it. Most of the buildings were locked, including the cottages, but a few were open. The snickarbod for one. I really enjoyed seeing the old workbench as well as an hand operated lathe. I wonder if they lay wood eggs? As much as I love seeing old buildings, especially the simple, everyday sort, I enjoy seeing the furniture and tools of bygone ages even more. The time I was invited to take a look at the old farmhouse in Gammla Gård about 8 miles from the apartment still makes me smile. The old attic full of everything from butter churns and spinning wheels to animal yokes, bits of harness, axes, planes (the woodworking sort) and more. I could spend ages looking such collections. The second open building I came to I’d call an animal shed I suppose. I would feel a little hard pressed to call it barn as it was so small and more like a windowless cottage without interior walls. Within I found a few wooden animals! The caretakers certainly had gone the extra mile to add to the charm of the place. The wooden chickens were immediately left of the entrance. A life-size wooden cow posed eating at a manger and waiting to be milked, complete with stool and pail, was right in front of the door. Most of the interior was cluttered with yokes (leather and wood), harness and quite a few other bits and pieces I couldn’t identify the function of. Seeing paint and carving on what appeared to be small yokes surprised me. Given the size of them, I’m not entirely certain they were yokes though they had roughly the correct shape. I guess the long winters with the snow and very short days left plenty of time to decorate mundane objects. Just left of the animal shed was something called the portliden. Port means ‘gate’ but I’m not entirely certain what liden means specifically. Some sort of building obviously. This one had a passage in the center with a gate. I loved the life-sized horse, complete with saddle and bridle, standing in the gateway! Walking over for a closer look at the horse’s tack, Loke rushed ahead. I missed capturing the cute moment when he stretched up to touch noses with it. While I fumbled with turning the camera on, he wagged his tail with his head cocked as if wondering why it didn’t return his greeting. He was trying to be friendly after all. Only then did he stick his nose in the bucket to see what it had. I couldn’t help but laugh. See now why I love cycling with my husky so much? Many more smiles and laughs. The last of the open buildings was the smithy! Quite a large one actually. The one at Gysinge which had been closed is much bigger, but most village/country smithies are smaller than our kitchen. The smithy had been moved from another place in the 1950’s and it looks like they brought everything! Ashes and bits of charcoal were in the forge, countless hammers, chisels and tongs. Maybe it’s used to keep the ironwork of the buildings repaired. I enjoyed exploring the village. Knowing that flies awaited our return to the road, I felt no hurry to move on. The sun began to make an off and on appearance driving up the temperature which added to my reluctance. Tables and benches with small floral centerpieces sat outside the cafe parstuga. Benches ringed the area in the shade. I sat on a bench and began making a post to FB. A couple sat in the sun, chatting and reading. Loke rolled in the grass at my feet briefly before relaxing. Just as I hit send, the man disappeared into the cafe cottage and came out with a green dog dish full of water. Loke saw it and jumped to his feet in hopes of food as the man greeted him. Once he realized it was only water, Loke lost all interest. I was more appreciative of the random kindness. Moments like that warm the spirit. At least it showed I had given Loke plenty of water. After a while, I went back to the trike, but only to roll it into the dense shade of a tree to use it as a comfy recliner. Jens called around 2:30 pm. I told him I was hanging out at the village because of the miserable riding conditions. I was perfectly happy to relax for a while so fish as long he liked. I had my iPhone with a strong WiFi connection so I could amuse myself in between listening to birds and admiring the scenery. People came and went with surprising frequency for such a small, tucked away place. Vastly more pleasant a time than pedaling through hell. Clouds thickened again and wind kicked up. I even felt a bit cool which was luxurious. Loke relaxed for a while. He’d get up to move to a new spot every now and again. That ended around 4 pm. He abruptly stood and woofed at me. Ears pricked, eyes bright he wagged his tail. When he didn’t get a response, he woofed again and pawed at my arm. I knew he wasn’t going to stop. Resigned, I prepped to move out again in hopes the higher wind would put the flies down… most of them at least. As just thinking of riding on summoned them, flies did appear. Fortunately, they were smaller ones that don’t bite. At least I didn’t feel any. Still annoying to have small buzzing things bouncing off the face. Loke was insane with glee as we began moving out. He also managed to lose two of his socks. I had to stop and go back for them. He made getting them back on quite a challenge. As I wrestled with him and them, Jens called to say he was done. I asked if it was okay if I cycled to the church a little down the road, it couldn’t be more than 10 minutes away. He’d meet me there. Socks settled, appointment to rendezvous with my hubby made, we took off with Loke pulling as if hundreds of hares fled before us. I let him go and helped to give him slack. We hit 20 mph. The church couldn’t be more than a mile and a half away. I coasted into the parking lot across from Österfarnebo Kyrka. We beat Jens there by quite a few minutes. Giving Loke water, I waited for Jens to catch up so he could walk around with the fuzzy one during my exploration around the church. The church had a certain appeal and after loading the trike, I was off to do a quick walk around the grave yard to look for runestones. Sadly, none to be found. After all was said and done, Loke and I had covered just 7 miles of the 28 I’d mapped. Oddly, I felt not a bit of disappointment in that fact. Other than the times when I was surrounded by flying blood tankers, it had been a pleasant even if I spent most of it lounging around. The video was neat to see, but there are problems. Sound is essentially none existent since the mic is on the camera which is sealed in a very durable watertight case. We expected that so no worries except for the thwack, thwack sound for most of the footage clips which I think were the flapping straps hitting the case. Mounting is an issue. I had the camera a little too far forward on my helm and, though tilted upward as far as it would go, too much of me was in frame. I love to see scenery, not me from hips to toes clad in spandex and running shorts. Loke loping and trotting to the far right of frame was fun to watch. There is a serious drawback to it being helmet mounted. I want the camera to ‘see’ what I see. If I look to the left or right to see horses, deer, or even a flapping peacock, I want it recorded. When I pedal, my head bobs from side to side. That does nauseating things to the camera view. So, I have some serious thinking to do. Battery life is also quite short, but that’s to be expected. Tiny camera doing a lot of work to record with small battery. I’m not going to share any of the video I took this time, but hopefully I can get the framing problem settled and will have something to share soon! I’ve ridden a few times since my last post. It’s been quiet on here since the quick, short rides lacked anything worth mentioning. The joys of hamster-wheeling. Only trainer pedaling can be more tedious, but it’s still good for the fuzzy one and I to move. With both husky and I feeling pretty sluggish about going out for more local loops, Jens suggested I plot something a bit further from home. Something I’ve not ridden this year at least. I took him up on the offer and decided to track down a few items of interest. The runestones at Danmark Church were the first that came to mind. The possibility of riding all the way home instead of needing a pickup were quiet high as well. Rather than starting from Danmark though, I decided to add a few more miles by riding out from a little church southeast of Danmark called Lagga. There’s information for the church now if you click the thumbnail. When I first began blogging, I didn’t have the ‘fine art’ of researching the churches and supplying information for them settled yet. In spite of it’s humdrum exterior, Wikipedia photos of the interior show it to be quite lovely and very medieval. I often feel I’m missing out when I can’t go in for photos. Ah well. Back to the ride. In no time, we arrived in the tiny village of Lagga. I set about to unloading the trike while Jens walked around with Loke. The fuzzy one was quite excited, running about like a mad dog as he marked everything in sight. As I started the GPS and triple checked for my cell phone, Jens asked me where was the camera bag. I did the face-palm thing as the image of it sitting on a dining chair popped into my head. I grumbled about my iPhone camera would have to do when Jens offered me his little point-n-click which he always keeps in the pocket of a jacket. Happily, I accepted. It’s a much better camera than my old point-n-click which gave me skies of green, yellow or white, never blue. It takes photos nearly as nice as the Canon’s auto-settings quite honestly. In short order, Loke and I were on our way. Just a building I liked. Two things struck me as we started out. One, it was muggy and warm. Two, it was quite windy. Not as strong as my September tour last year when I was riding in the leftovers of a hurricane, but significant. Fortunately, Loke and I seemed to be going with it most of the way rather than against. At worst, we had it on a front quarter which still made us work a bit. With the sun mostly out, I made absolutely certain to stop frequently to water Loke and drench his ears. His socks went on as soon as he had finished his 1 mile dash. No reason to wear his feet out. In spite of the heat and the annoying socks, Loke ran strong. He really kicked the speed up when our car passed. I let him burn some of that wild burst of energy before stopping to offer water and wet his ears. In no time at all, we were zipping past the Mora Stones along the Sverigeleden and then turning to go past one of the Linne landmarks in the area. Still no pictures of that place though I stopped in the parking lot to check Loke’s socks. The very same ones I’d been using since the long weekend. I saw right away this ride was their retirement ride. I’d added another layer of tape as Loke had worn through the previous ones, but now the fabric had frayed and parted around his toenails. I prefer not to tape over that since I don’t want anything sticking to Loke’s toenails, fur or skin. They’d hold up till we got home, but that would be the end. Still, over 60 miles is a new record by many, many miles. Riding up a hill past some old buildings and we arrived at Danmark Church. I still enjoy seeing this old church. It’s always baffled me why it’s named ‘Danmark’ which in today’s Swedish is clearly Denmark. Why on earth would they have named a church after a country they constantly warred with? As ever with lingual history, it’s a bit more complicated than that. Clicking the thumbnail brings up a brief history of the church and no less than 3 theories about the name. I’m kinda agreeing with the place-name scholars who are looking at the Old Norse language. Surely there are dozens of other name theories I didn’t find, but I rather like the Old Norse one. My research into the church also found mention of ‘dozens of runestones in the area’. Hmm. That could mean I should continue searching the area? Well, any excuse that might give me a boost to ride is a good one! Parking next to a small building outside the churchyard, Loke and I walked up the slope and through the gates in search of the elusive stones. Actually, the first one wasn’t very hard to find at all. It stood just a few meters from the church’s tower entrance. Upplands Runestone #945 collected, I continued around the church, admiring the brick architecture while searching for more runestones embedded in the walls. Loke threw himself down in the short clipped grass a few times, wiggling on his back with a huge tongue flopping husky grin. It was during one of those thrashing sessions, I spotted another runestone. The top of it any way. 3 foot tall weeds stood between me and it. I followed the edge of the cut grass, hoping a path had been cut to the stone. No such luck. I stood there for a minute or three, staring at it and the sign next to it. I couldn’t bring myself to go to it. The thought of ticks creeping on the weed stalks made my skin crawl. I suppose I could look at it as an excuse for a winter ride! I found no other stones but those two and went back to pedaling. It was a quick zip down a long hill that took us under the E4. The plan was to stay with the Sverigeleden until a certain point where I would take a shorter way through Uppsala to home. It kinda worked out that way, though not as I’d anticipated which would have had me on a cycle paths a bit more. Somehow, I missed a Sverigeleden sign which would have led me to a long-ish, steep-ish climb and then a turn onto a path to go along fields and busy roads. Instead, Loke and I found ourselves on a semi-busy road with no shoulder. It wasn’t too bad thanks to good timing of traffic, Loke deciding to lope along at 14 mph instead of trotting at 8 mph and, of course, the kindness of Swedish drivers. It took less than a mile before I realized the missed turn, but decided to press on. The huge blue bulk of the Ikea grew. While not an interesting stretch of cycling, it did at least have a path. Then the road turned away from the Swedish flatpack furniture store and I came out at a place I recognized from frequent car travel and better than anticipated since noticing my error. A left turn would carry me along a cycle path beside the very heavily trafficked road and over Uppsala’s only drawbridge where a ramp would take me down to the gravel river path into the very heart of Uppsala. Perfect! As we came down the ramp and whipped around the left turn onto the path, Loke wanted to go at a flat out 16+ mph gallop. As I kept him to a more respectable 10 mph lope out of respect for the foot and cycle traffic, he shot me little side glances with ears at the ‘irritated’ angle. It felt cooler by the river. It might have been due to the trees more than anything. Regardless of the why, I enjoyed it and it gave Loke a bit more energy as well. He even refused an offer of water, a first for the ride. The river path through the town goes past an old pump house where I would be forced onto a road with a cycle lane. Lots of pedestrians and cars. Spontaneously, I took a left turn, following some guys on road bikes which took me through other spots I recognized. As I went, every grassy spot open to the sun I passed was covered with people. The Swedish sunworshipers were out in force! I ended up close to the hospital grounds. With another impulsive whimsy, decided to go through and then along the road which would lead me to the castle. I hoped I’d be able to climb it from the side opposite my last attempt. I had a vague memory that a road went up to it from that side. More importantly, a paved road. Much less chance of wheel slip! Memory served me well and I pedaled up the hill in the shade of old trees, passed the field where an International Jousting tournament had once been held. I smile when I think of that tourney discovered quite by accident during the first months of owning my Trice QNT. I’d purchased it in July. It was a glorious September day. Loke wasn’t running with me then. I didn’t even have a running bar yet since I was going to wait until he was at least a year and a half. No chance I was going to risk permanently injuring him. After passing the castle, I spotted the medieval faire collection of tents and people in costume. A family came across the road, dressed in full costume and I asked in my then, VERY poor Swedish if it was an SCA event. The man answered me in English that it was an international jousting tourney. I thanked him and immediately pedaled like mad for home to drag Jens there. It made for a pleasant afternoon. Gave me the itch to rejoin the SCA though I still haven’t done so. See what cycling can lead to? Back to the near present. The road was very easy to climb and an arched portal visible at the top of the hill. I pedaled a little faster, eager to go through to the courtyard beyond which has a fountain and a nice view down to the royal/botanical gardens across the road below the old defensive works. I needn’t have rushed. Stairs blocked my way and in spite of the parking lot up there, I had no place to lock my trike. At the end of the parking lot was a well-packed gravel path disappearing around the back of the castle. Having never been on that side, I went for a look. Right up against the castle is a well manicured pleasure garden. It was fenced off and screened by a hedge, but glimpses of colorful flowers could be seen between the leaves and I heard the gurgle and splash of water which must have been a small fountain. The view up there was impressive. From the high vantage I could see the entire eastern stretch of Uppsala. Even Danmark’s steeple was visible over 4 miles away as the crow files. The photos I took were disappointing, the trees becoming an indistinct melange of green and modern buildings all but smothering the outlines of the beautiful architectural character of the older. One thing stood above the rest. Only the south tower of the castle stands above it. The steeples of Uppsala’s cathedral. I finished the loop around the castle. At the other entrance, I could have taken the trike to the upper courtyard, but so many people strolled in and out it would have been rude to push in with a dog and trike. I resigned myself to simply heading home. It was a brake gripping ride down high hill to the rest of Uppsala below. The furball at my side wanted to run of course. On gravel and many people, it would have been a disaster of gigantic proportions. Soon we were warping down the gravel path next to the old cemetery. From there home was a short jump. I felt fine as we coasted to a stop. Though Loke’s tongue hung nearly to his toes, he had plenty of energy to jump up the stairs to the apartment. I guess after two days in a row of 22´+ miles, 15 miles from Lagga to home was small change. It felt good to find a new runestone and simply get out for a ride even if it wasn’t completely new places. Now, I have even more to search for in the area!